With the release of the second live event “Come With Me! !” today, I figure this is as good as time as any to go back and take a look at the first K-On! live event. 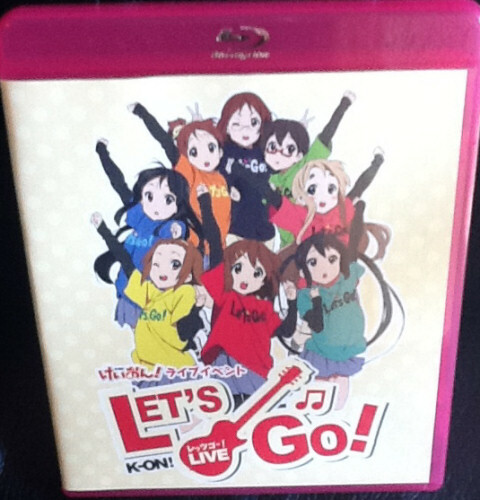 The “Let’s Go!” concert took place in Yokohama Arena on December 30th, 2009 and was released on DVD and Blu-Ray Limited Edition on June 30th, 2010. I’ll be looking at the Blu-Ray version, which topped the Japanese music Blu-Ray charts in its week of release. Note that for new fans who haven’t seen all of K-On! yet, some of the things discussed in this review could be seen as light spoilers. 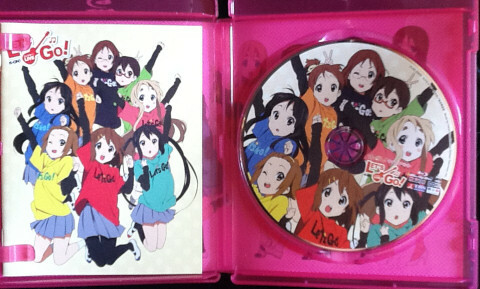 The “Let’s Go!” Blu-Ray, like all “K-On!” Blu-Ray discs, comes in a pink case. The disc label features the same artwork as the cover, as does the front page of the included 24 page booklet. The inside of the cover displays the same artwork used as the background for the disc’s top menu. At first start-up, the Blu-Ray gives you the usual non-skippable company logos before heading straight into the main feature. Unlike other K-On! Blu-Ray discs, this is a dual-layer BD and it’s not hard to understand why. The main feature lasts for a whopping two and a half hours (2 hours and 33 minutes, to be exact), and contains two uncompressed PCM audio tracks – one 2.0 stereo mix, and a 5.1 surround mix. The video is presented in 1080i, and looks very good – the production is very slick and professional, this is no cheaply shot half-assed release. 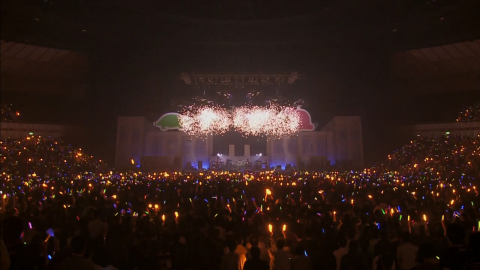 The stage, the performers and the audience are all lit up by an onslaught of lights and fireworks as the cast explode into their opening song; “Cagayake!GIRLS”. 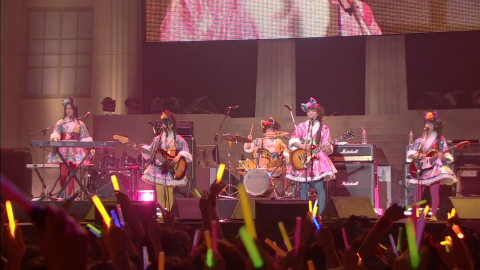 The five cast members – Aki Toyosaki (Yui), Yoko Hikasa (Mio), Satomi Sato (Ritsu), Minako Kotobuki (Tsumugi) and Ayana Taketatsu (Azusa) – perform in the same band formation as their characters do in the anime, with each member “playing” the instrument of their respective character. I say “playing” with quotation marks because they obviously aren’t playing the instruments for real – it’s just for show, and the music is pre-recorded and identical with the CD version (with the obvious exception of the vocals, which are performed live). Now, some music purists might take issue with this, and frankly I can understand that to a certain degree. 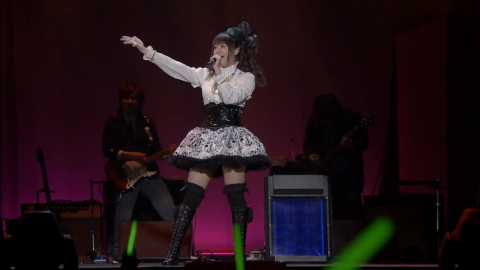 But consider this: This is an event featuring voice actors from a TV anime, not a rock’n’roll show. Those voice actors aren’t musicians. 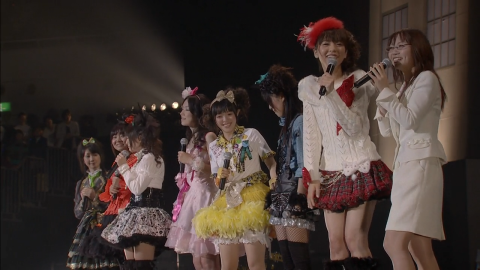 Would it really have been better to have them all just standing around while Toyosaki does the vocals, only chiming in with the occasional “Wasshoi!” and “Here we go!”? In my opinion; no – it’s by far preferable to have them put on a bit of a show, cheesy as it might be (although as far as cheesiness goes, I’d argue that this comes out rather favorably when compared to some other anime live events – the fact that K-On! is a music themed anime to begin with probably helps in that regard). After the opening song, the cast introduce themselves, chit-chat and flirt with the audience for about five minutes. They then leave the stage, and it’s time for the character songs. First up is Toyosaki with “Guitar ni Kubiddake” and a sight to behold it is. 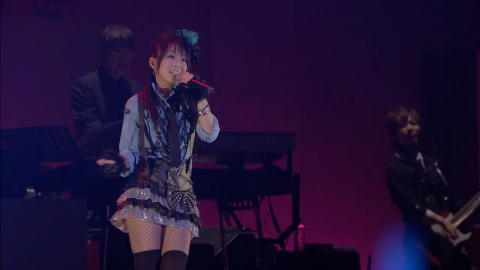 Toyosaki has great stage presence, and delivers an energetic, cute and overall very impressive performance. Not very far behind is Hikasa with “Heart Goes Boom! 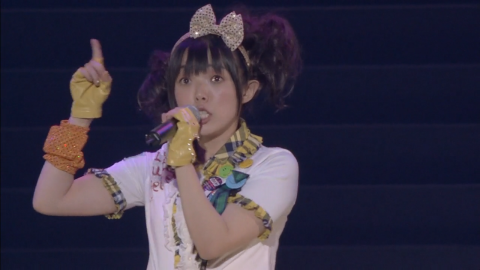 !”, complete with a “moe moe kyun!” in the middle of the song. Satomi Sato is next, with “Girly Storm Shissou Stick”. She’s clearly not the best singer in the bunch, but her spirited and very Ritsu-like performance more than makes up for it. Minako Kotobuki, for her turn, does a fine job with “Dear My Keys ~Kenban no Mahou~” but seems to forget to sing in proper Mugi voice. The final character song in this round is “Jajauma Way To Go”, with Ayana Taketatsu doing the honors. The character songs are all performed completely live, with a full backing band on stage. 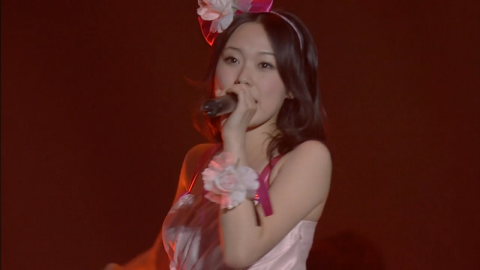 Each of the band members get to do a solo performance as a kind of introduction to the song performed by the character playing their respective instrument in the anime. Once the character songs are done with, ominous background music begins to play as a familiar-looking figure emerges from the shadows. Observant viewers will recognize it – it’s the costume Sawako wore in her younger days, during her time as a member of Death Devil. The mask falls, and we see the person behind it is indeed none other than “Sawako” herself – Asami Sanada. She straps on Sawako’s V-shaped guitar, and does the opening speech from “Hell The World”, then launches into “Maddy Candy”, which rocks about as hard as one would expect from a band named “Death Devil”. 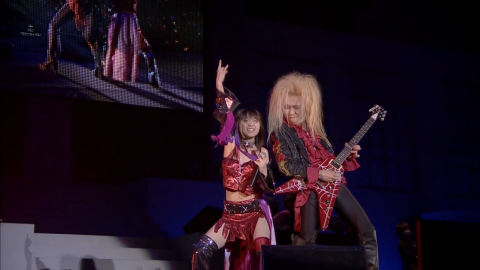 Although Sanada doesn’t actually play the guitar, the song is performed live by the backing band and guest guitarist She-ja. When that’s over, the five main cast members come back on stage. They introduce the next two performers, Madoka Yonezawa (Ui) and Chika Fujito (Nodoka). After a bit of chit-chat, they are joined by Sanada, this time in full “teacher mode” Sawako outfit. With the full cast present, they engage in a game of “Call and Response” with the audience – that is, each cast member gets to introduce their character’s most popular phrase from the anime, and have the audience shout it back at them. Yonezawa and Fujito then do their character songs (“Lovely Sister LOVE” and “Coolly Hotty Tension Hi! !”, respectively), and quite well I might add. 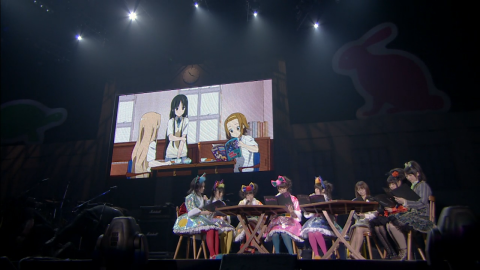 The full cast then re-appear and sit down at a table where they proceed to perform a K-On! scene in-character. That is; they read from a script, and the big screen shows relevant artwork of their characters while the scene is being read. The scene is one written especially for the event, and not one featured in the actual anime. For a fan, it’s quite interesting to watch the cast at work and the script is fairly entertaining. Then, at long last, it’s time for the Ho-kago Tea Time performance. The five main cast members re-form their “band” and we are treated to the songs “Curry nochi Rice” and “Fudepen ~Ballpen~”. 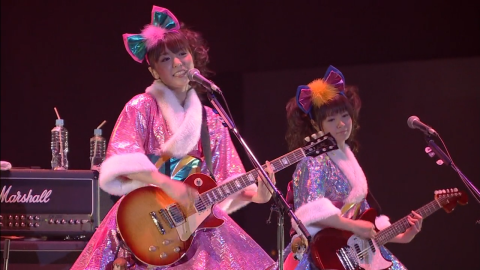 As with “Cagayake!GIRLS”, the performance consists of them “fake-playing” their instruments while Toyosaki and Hikasa do the vocals. Toyosaki then surprises the audience by announcing that from this point on, they will play their own instruments for real! And for the next song, they do just that. 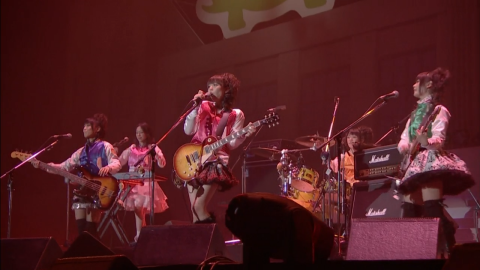 As “Watashi no Koi wa Hotchkiss” is played, it is clear that this is not a fake performance at all – these ladies have, although they’re clearly not professional musicians, obviously practiced hard to be able to actually play at least a couple of songs live. And when taking into account their lack of musical experience, their effort here is more than passable. While not anywhere near perfect, they get through the song okay and manage to make it an enjoyable experience, which is quite admirable. 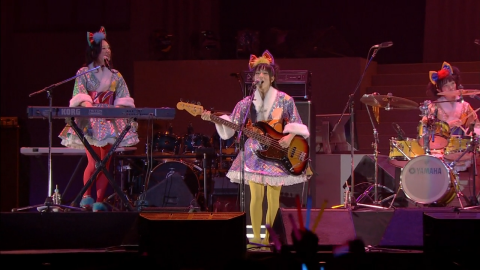 For their second “true” live song, they play what must surely be the signature tune of their animated counterparts – that, of course, being “Fuwa Fuwa Time”. It’s a rather simplified version of the song, without the more complicated bridge, that they pull of rather well for the most part. Towards the end, Hikasa's voice breaks and tears start falling – she’s overwhelmed, it appears, by the ecstatic response of the crowd. The feeling seems contagious, as moments later, several cast members can be spotted wiping tears from their faces. 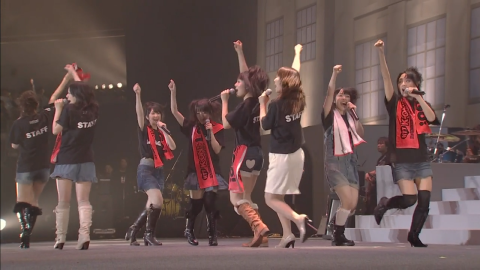 And then, just like with Ho-kago Tea Time’s triumphant performance in the season 1 finale, Kotobuki kicks off an extra chorus of “Fuwa Fuwa Time” to bring things to a climax. Then, they leave the stage. But it’s not the end! For the encore, the cast return to their “fake-playing” ways from before, but if there is one song that will make everyone forget about that and just have fun it’s the one that was the biggest K-On! hit at this time – “Don’t Say “Lazy””. The crowd goes nuts for this one – but the greatest roar is still to come. 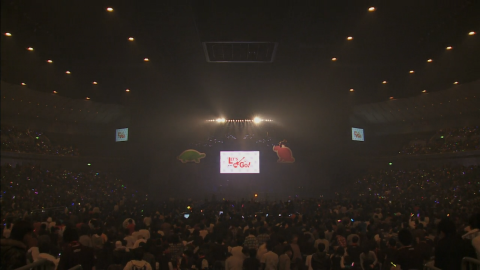 Between songs, Toyosaki lets the audience know the cast has an announcement to make, and a video begins to play on the big screen. A series of still images from the first season set to the tones of “Ano Hi no Yume” is suddenly interrupted by a clip of that season 1 finale performance of “Fuwa Fuwa Time”, and then words appear on the screen: A second season of K-On! is coming! The crowd goes absolutely batcrap insane. The level of pure unadulterated geek joy is so overwhelming it is almost touching. And before the emotional high has any chance of fading away, the cast launches into one more encore performance of “Cagayake!GIRLS” before leaving the stage one more time. But it’s still not the end! The cast, the entire cast, re-appear, all wearing identical staff shirts. Things wind down now. Each cast member gets a moment to say a few words. Tears are shed, people thanked, band members credited. And then, at the very end, everyone comes together for one last grand performance of “Let’s Go!”. Finally everyone leaves the stage for the final time while “Ii Yume Mite ne” from Hajime Hyakkoku’s OST plays over the speakers. And then, it ends. 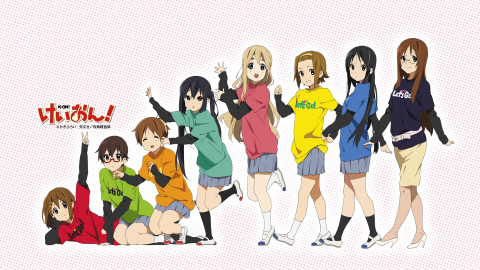 With a lengthy main feature, great audio and video quality and even a 16 minute long backstage featurette, “K-On! 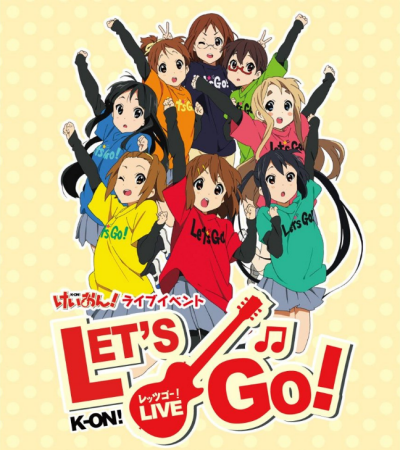 Live Event – Let’s Go!” is a lot of fun for a K-On! fan – at least, for the type of fan that would enjoy geeking out to the voice cast singing, dancing and goofing around for a couple of hours. With a list price of 8,190 yen it admittedly doesn’t come cheap, but I can’t imagine it not being worth it for a collector. I'm afraid not, those pages are from the CD version (the first picture is from the LE only) and are not included in the Blu-Ray booklet.